Germany's players celebrate after their team's victory over Sweden during the Rio 2016 Olympic Games women's soccer gold medal match at the Maracana stadium in Rio de Janeiro, Brazil, on Aug. 19, 2016. 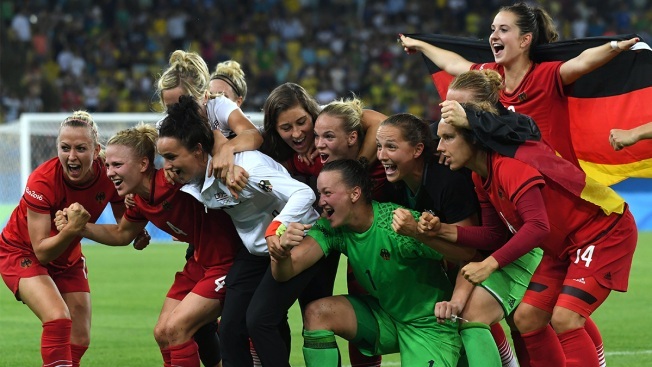 Germany defeated Sweden 2-1 on Friday to win the women's soccer gold medal for the first time. Germany opened the scoring with a goal by Dzsenifer Marozsan in the 48th minute and added to the lead with an own goal by Swedish defender Linda Sembrant in the 62nd. Sweden pulled one closer with Stina Blackstenius in the 67th but was not able to get the equalizer despite some good late chances at the Maracana Stadium. A two-time World Cup champion, Germany had previously won three bronze medals. It was playing in the Olympic final for the first time. Sweden has won its first silver in women's soccer. It had never been on the podium. Germany is the second-ranked team in the world, but for much of the tournament the team did not look like one of the world’s best. 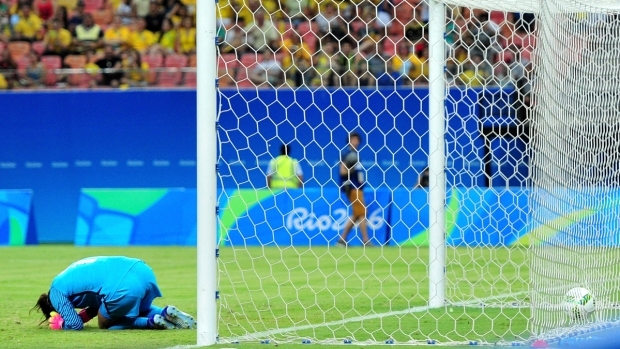 However, since a slow start in group play, Germany advanced to the gold medal match by back-to-back shutouts. The team has been led by Melanie Behringer. Behringer, a member of the 2008 bronze medal-winning team, takes all of Germany’s set pieces and has played at a very high level at the 2016 Olympics. Sweden beat the odds to get to the final game. After finishing third in Group C, the Swedes faced off against the mighty Americans in the quarterfinals. While the team looked outmatched through much of the match, Sweden was able to play to a 1-1 draw with the U.S. through 120 minutes. Then, in the penalty shootout, Sweden came out on top. The team used a similar script against Brazil in the semifinals. Seemingly outmatched again against a Brazil team that it lost to 5-1 in group play, Sweden bunkered down in a defensive shell and kept Brazil scoreless through regulation and extra time. Facing another penalty shootout, Swedish goalkeeper Hedvig Lindahl came up with two huge saves to help her team to the victory. Earlier on Friday, Canada won the bronze medal, beating Brazil 2-1.